When the City of Surrey proposed a light rail transit system as its solution to the municipality’s inefficient transportation network seven years ago, it likely didn’t expect to receive such a passionate response. Citizens from the Fraser Valley to North Vancouver have come out of the woodwork to make their voices heard regarding what transiting in Surrey ought to look like, whether they are radically pro-Skytrain, pro-LRT, or planted firmly on the fence. The project was first proposed in 2010, with public consultation by TransLink and the city beginning in March. In 2015, TransLink provided funding for the design work, and the Mayor’s Council and TransLink’s Board of Directors approved the first phase of its 10-year vision for Metro Vancouver Transit and Transportation—which gave the green light to pre-construction and consultation on the Surrey light rail—only a few months ago. Phase two would ensure initiation of light rail construction within the year. If it is built, Surrey’s light rail transit network will put electric trains on the street, in a lane that travels alongside cars, cyclists, and pedestrians. It will have two routes: one that runs from Surrey through Newton and out to Guildford, and another which runs from Surrey to Langley covering 27 kilometres and 19 stops. The most common concerns about LRT are its speed and safety. Because it is built on the streets, passengers share the same grievances and risks as drivers, such as potential accidents and being stalled by traffic lights. Common praises of the system are its low construction cost and ability to directly connect town centres, even in more remote areas that would be hard to reach by Skytrain. 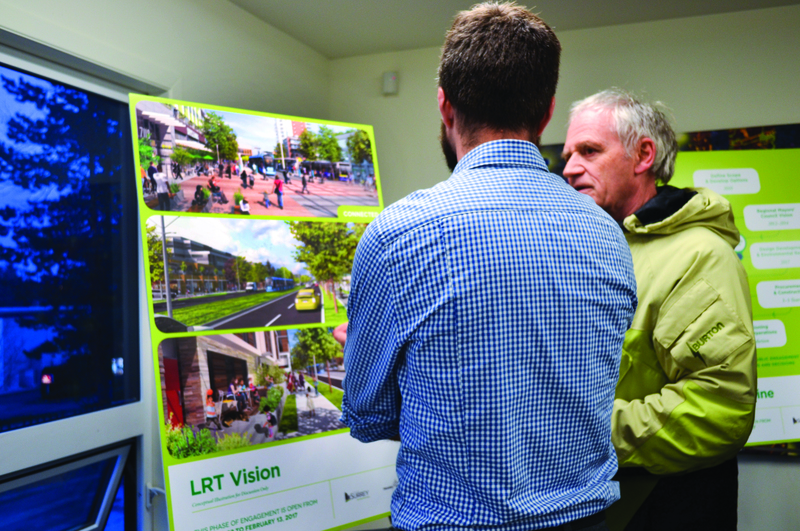 Because LRT did turn out to be a contentious issue, consultations and related events are still being organized. One such occasion was held on Jan. 26 at the Newton Cultural Centre in Surrey. Surprisingly, most of the folks there seemed to have a relatively neutral stance on light rail transit. Many went to the open house hoping to learn more about the issue. Surrey resident Ben Penner, who is also concerned about the capacity of the trains and efficiency of the existing Skytrain, is also open to both proposed transit systems.